This article is about the rock. For the 1981 album by The Sinceros, see Pet Rock (album). Pet Rock is a collectible made in 1975 by advertising executive Gary Dahl. Pet Rocks are smooth stones from Mexico's Rosarito Beach. They were marketed like live pets, in custom cardboard boxes, complete with straw and breathing holes. The fad lasted about six months, ending after a short increase in sales during the Christmas season of December 1975. Although by February 1976 they were discounted due to lower sales, Dahl sold 1.5 million Pet Rocks for $4 each, and became a millionaire. With his money, Dahl opened a bar named "Carry Nations" in downtown Los Gatos, California, a reference to Carrie Nation. Dahl continued to work in advertising; however, he avoided interviews for years, because "a bunch of wackos" harassed him with lawsuits and threats. Dahl said in 1988, "Sometimes I look back and wonder if my life would have been simpler if I hadn't done it." In April 1975, in a bar in Bonny Doon, Gary Dahl listened to his friends complain about their pets; this gave him the idea for the perfect "pet": a rock. A rock would not need to be fed, walked, bathed, or groomed, and it would not die, become sick, or be disobedient. Dahl said that they were to be the perfect pets and joked about it with his friends. Dahl took his "pet" idea seriously, however, and drafted an instruction manual for a pet rock. The manual was full of puns and gags that referred to the rock as an actual pet. Dahl's biggest expense was the die-cutting and manufacture of the boxes. The rocks only cost a penny each, and the straw was nearly free. 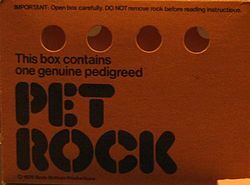 For the initial run of booklets, Dahl had a printing job for a client, and "tacked" the pet rock booklet onto the main job. This resulted in a batch requiring only a cut and trim, at almost no cost except for some labor. A 32-page official training manual titled The Care and Training of Your Pet Rock was included, with instructions on how to properly raise and care for one's new Pet Rock (notably lacking instructions for feeding, bathing, and so on). The instruction manual was the real product, full of gags, puns and jokes, and contained several commands that could be taught to the new pet. While "sit" and "stay" were effortless to accomplish, "roll over" usually required a little extra help from the trainer. "Come," "stand" and "shake hands" were found to be near-impossible to teach; however, "attack" was fairly simple (also with some additional help from the owner's force). The Pet Rock became available again on September 3, 2012. 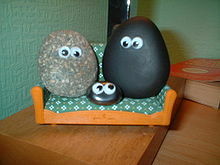 Rosebud Entertainment currently holds the United States trademark rights to the Pet Rock. ^ a b c Woo, Elaine (April 1, 2015). "Gary Ross Dahl, originator of '70s Pet Rock sensation, dies at 78". Los Angeles Times. Retrieved 2015-04-01. ^ a b Bathroom Reader's Institution (ed.). "The Latest Thing". Uncle John's Legendary Lost Bathroom Reader. Portable Press. p. 373. ISBN 1-879682-74-5. ^ a b "Pet rock millionaire offers a new method to getting stoned". The Miami News. Associated Press. 1977-02-07. pp. 2A. Retrieved December 18, 2011. ^ a b "Between Pet Rock and a hard place". The Milwaukee Journal. 1988-11-15. pp. 2A. Retrieved December 18, 2011. ^ Olson, James Stuart (1999). Historical Dictionary of the 1970s. Greenwood Publishing Group. p. 284. ^ Jane and Michael Stern (1992). "Pet Rocks". Encyclopedia of POP Culture. Harper Perennial Press. Retrieved 2015-07-18. ^ "The Care and Training of Your Pet Rock Manual by Gary Dahl". Scribd.